A year and a half ago I wrote a blog post about using AFPd on my hacked iPhone to get access to my phone’s file system through Finder using Apple’s AFP system. When firmware 2.0 came out I went legit with my phone and lost touch with jailbreak app updates. I recently re-jailbroke my iPhone and now I’m having to relearn how to accomplish the things I used to have set up. A lot has changed in a year and a half! AFPd apparently broke with firmware 2.0, and Netatalk was developed to take its place. You’ll find Netatalk in Cydia. If it’s not showing up under default repositories, do a web search to find out where it’s living. Once installed, you’ll see your device as a shared computer in the left sidebar of Finder. When you select the device, you’ll need to hit “Connect As…” and log in as either root or mobile. If you haven’t changed the password for these accounts, it will be alpine, but you really should change this password. 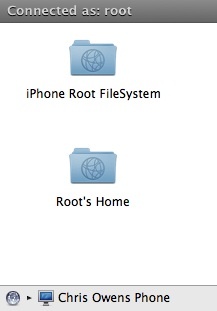 Until you do, anyone who knows anything about Mobile OSX defaults will be able to access your file system. That point about security brings up another issue… anyone on a Mac on the same WiFi network as your device will see your name in their finder sidebar. It’s not a huge deal, I’m a pretty public person, but I’d still like better control over my name being thrown around in places like coffee shops and other public connections. This is where RupertGee’s Boss Prefs toggle comes in. With it installed, you can turn AFP on and off instantly, letting you control the broadcasting of your name as you roam around networks.